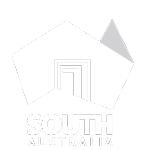 In 2013, high priority exotic plant pests and diseases to Australian viticulture were identified through the development of the Viticulture Industry Biosecurity Plan. Priority ratings considered the entry, establishment and spread probabilities for each pest in Australia, the likely impacts of the pest on cost of production, productivity, removal of quarantine barriers and market access, and how difficult the organism would be to control and/or eradicate. Below are some of these high priority plant pests and diseases. It is vital that Australia is adequately prepared to respond to an incursion of an exotic plant pest or disease. This response relies heavily on growers (and the general public) identifying something unusual and reporting it straight away. 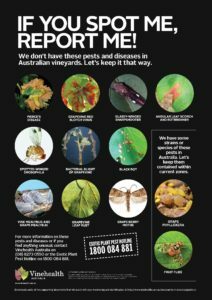 To help, Vinehealth Australia has produced a handy poster called, “If You Spot Me, Report Me” and associated documentation which provides technical information about each of these pests and diseases. If you find something unusual that looks like one of these exotic plant pests or diseases, or notifiable established pests such as Grape phylloxera, Queensland Fruit Fly or Mediterranean Fruit Fly you must report it to the Exotic Plant Pest Hotline on 1800 084 881, or call Vinehealth Australia.